Dasarath Chand municipality in far western Nepal has suffered from an acute water shortage for several years. To meet the area’s water demand, a new project to provided sufficient water for their daily life of municipal citizens is under construction with support from Asian Development Bank (ADB). While the project is under construction, upstream communities of the water source (Gwallek area) have been discussing incentivising the water supply to the municipality while downstream water users have been discussing sustainable supply of water to the municipality. The local municipality requested the assistance of the Kailash Sacred Landscape Conservation and Development Initiatives of the International Centre for Integrated Mountain Development (ICIMOD) the South Asian Network for Development and Environmental Economics (SANDEE), and local partner SADA Nepal, to carry out research on linking upstream and downstream communities for sustainable municipal water supplies. The study focused on understanding willingness to pay (WtP) of water users, and willingness to accept (WtP) of upstream communities in different choice scenarios. 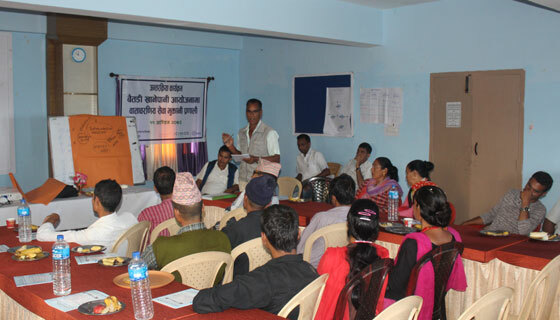 Rajesh Rai, Principal Investigator, presented the key findings of the study to a stakeholder consultation workshop recently in Dasarath Chand municipality. The study showed that downstream water users are willing to pay for upstream conservation efforts while upstream communities expect support from downstream water users to manage their forest resources, support in constructing public toilets, and income generating activities. The stakeholders meeting organised by the local municipality with support from ICIMOD, SANDEE and local partner SADA Nepal, agreed to pay for upstream communities. During the consultation, chairperson of the drinking water management committee Karna Bahadur Chand committed to incentivise upstream communities. Man Bahadur Kunwar, officiating Local Development Officer, said the District Development Committee was willing to support upstream communities to manage their water source, and community development activities. Stakeholders also agreed on payment for ecosystem services (PES), an institutional mechanism to manage the funds. Water users were keen to participate in the PES scheme paying additional fees for watershed management. Unfortunately the required budget for implementing PES is not sufficient for the first year making external support necessary to initiate the scheme for the Baitadi Drinking Water Project. After the first year, funds generated from water users will cover watershed activities.